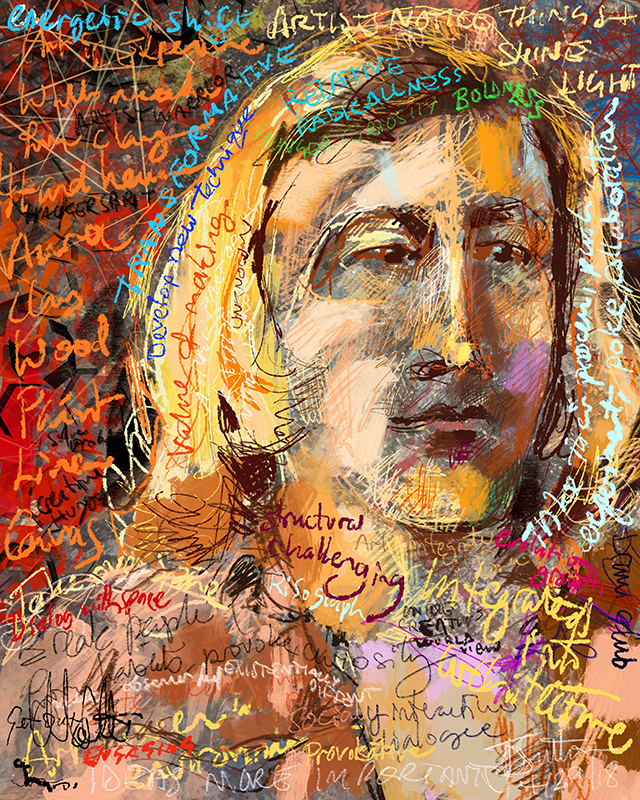 This sketch was created using an iPad Pro, Apple Pencil and Procreate app from direct observation of Drew Bennett, Founder and Director of the Facebook Artist in Residence Program, while he was giving a presentation, Designing Authentic Intersections between Art and Community , at the If So, What? art, design and technology fair/festival at the Palace of Fine Arts, San Francisco. As you can see, this artwork, in additional to being a portrait sketch, is also my notes on the fascinating and inspiring things Drew was saying. He shared his background and his own art and then led into talking about the wonderful artists he has brought into Facebook, showing examples of their work and discussing their process, how participation in the program effected the artists, and how their art interacts with, impacts and reflects the architecture, employees and company.